"As the United States serves notice that it plans to dominate world affairs by force, this finely researched book offers a timely and powerful warning to us all" - John Pilger, author of The New Rulers of the World. Following the US declaration of a 'war on terror', Washington hawks were quick to label Iraq part of an 'axis of evil'. After a tense build-up, in March 2003 the United States and Britain invaded Iraq, purportedly to protect Western publics from weapons of mass destruction (WMD). But was this the real reason, or simply a convenient pretext to veil a covert agenda? Using official sources, Ahmed investigates US and British claims about Iraq's WMD programmes, and in the process reveals the hidden motives behind the 2003 invasion and the grand strategy of which it is a part. He shows that the true goals of US-British policy in the Middle East are camouflaged by spin, PR declarations, and seemingly noble words. The reality can only be comprehended through knowledge of the history of Western intervention in the region. Ahmed demonstrates that such intervention has been dictated ruthlessly by economic and political interests, with little regard for human rights. He traces events of the past decades, beginning with the West's support for the highly-repressive Shah of Iran, his subsequent usurpation by the Ayatollah's Islamist regime, and the West's resultant backing of Saddam Hussein. The sponsorship of Saddam's tyranny - a self-serving tactic intended to strategically counterbalance Iran - included the supply of technology to build WMD as well as tacit complicity in their use against Iranians and Kurds. 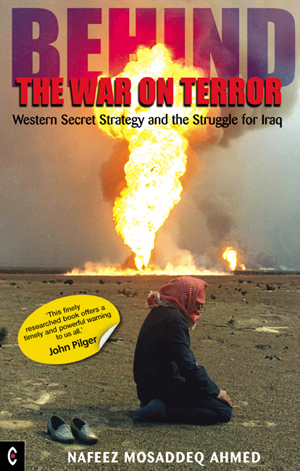 Ahmed's meticulous research into the secret history of Western manoeuvrings in the Middle East since the collapse of the Ottoman Empire, reveals the actual causes of the first Gulf War, the humanitarian catastrophe created by the twelve-year sanctions policy against Iraq, and the consistent obstructions of the 'Oil for Food' programme. He also provides information on the West's own widespread use of WMD, and the likely culprits of the 2001 anthrax attacks in the US.